Lifetime warranty. Power surges are the cause of most converter, inverter and other electronic failures in RVs. Converters, power centers, inverters and inverter/chargers have limited protection but are not intended to protect from surges. Even expensive inverter generators are responsible for many electrical failures including air conditioners, microwaves, refrigerators, etc. 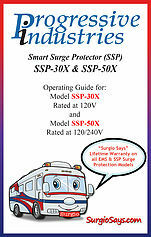 Surge protectors are inexpensive one time insurance and ours have a life time warranty! These products are portable RV surge protectors that also incorporate built-in polarity testers. 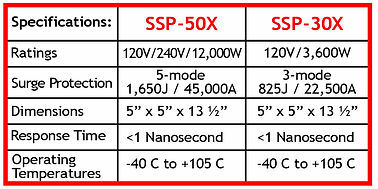 Available in 30 Amp and 50 Amp configurations. The Smart Surge 240V/50A provides 5-mode, 1,650 joules and 45,000 amp surge current rating. The built in surge status indicator notes the condition of the surge protector. Additionally, the dual line circuit tester checks for: Reverse Polarity, Open Neutral and Open Group prior to use. The sleek, compact, portable design makes it easy to use. No installation is required. This unit is designed for outdoor use. The Smart Surge 120V/30A provides 3-Mode, 825 joules and 22,500 amp surge current rating. The built in surge status indicator tells user surge protector is functioning properly. The integrated circuit tester checks for: Reverse Polarity, Open Neutral and Open Ground prior to use. The sleek, compact, portable design makes it easy to use. No installation is required and the unit is designed for outdoor use.